BRING THE GYM WITH YOU, ANYWHERE! 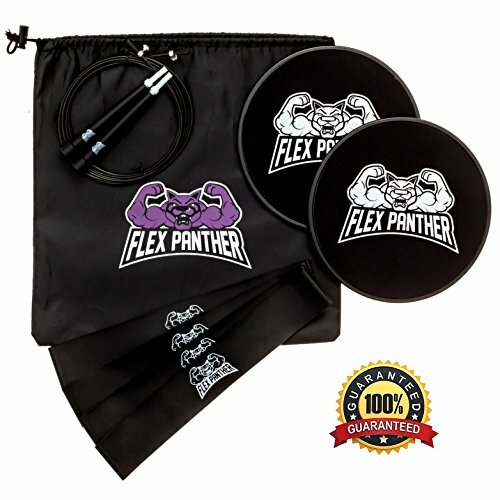 At less than 2 pounds, the Flex Panther exercise sliders set is perfect for anyone looking to get into the best shape of their life-whether at home, the office, or while traveling. This small but powerful exercise bundle is everything you need to strengthen every area of your body and improve your overall health and appearance! It is also the perfect set for use with many exercise programs, such as the Beachbody 80 Day Obsession program. 2 comfortable, 8 1/4" wide Gliding Discs. Designed larger than other discs, these are the perfect fit for any hand size. 4 durable, 12" long and 1mm thick Resistance Bands. Our bands are made of extra thick material, so they won't snap in the middle of your workout like other bands! 1 adjustable-length cable Jump Rope. Made of high-quality materials, this jump rope is built like a tank. 1 nylon Carrying Pouch with drawstring closure. For easy, compact carrying and use during travel, everything can go along with you. This set is ideal for a wide variety of physical results, no matter your goal! Build muscle and strength. The core sliders and resistance bands are the perfect combination for toning, strengthening, and growing your body. Lose weight. Making regular exercise with this kit a habit will burn calories and kickstart fat-burning mode! Gain flexibility. Performing simple, yoga-like stretches using the exercise sliders can dramatically improve muscle stiffness or pain. Improve balance. Practicing simple movements on the discs will aid your balance. Enhance recovery. Recover from a recent injury. ✅ PERFECT FOR EVERYBODY AND ANY WORKOUT PROGRAM: This exercise trifecta gives you the perfect full-body workout every time! Use the gliding discs for strength training of your abs, legs, chest, and more, and even for yoga poses, pilates, or stretching. Then get your cardio in using the jump rope, and any additional strengthening, toning, or stretching with the included resistance bands. Perfect for many popular workout programs like the Beachbody 80 Day Obsession! ✅ EXTRA LARGE GLIDING DISCS: Our gliding discs are nearly eight and a half inches wide, giving your hand ample room so that you can have the best, most comfortable workout. Other discs don't compare! ✅ MADE-TO-LAST RESISTANCE BANDS: Our extra-thick resistance bands are a millimeter thick, ensuring long-lasting, reliable bands that won't easily snap during use. ✅ PORTABLE AND WORKS WITH ALL SURFACES: Our double-sided gliding discs allow you to get a great workout in with any setting. The foam side can be used on hard surfaces, and the plastic side on carpet or rug. And weighing in at less than two pounds, the entire bundle can easily be transported and used while at the office, during travel, and any other time you're on the go. Carrying pouch included! ✅ MONEY-BACK GUARANTEE: If you're not one-hundred percent satisfied with your exercise bundle, simply contact us for your money back. If you have any questions about this product by Flex Panther, contact us by completing and submitting the form below. If you are looking for a specif part number, please include it with your message.